Heat the oils to ML and address it with your minced finery. Turn them back to L and let sit for an hour or two; this seems like a huge investment for an otherwise simple meal, but trust me on the flavor quotient. If you don’t have that much time to invest, don’t worry your heart — this will still turn out beyond edible. 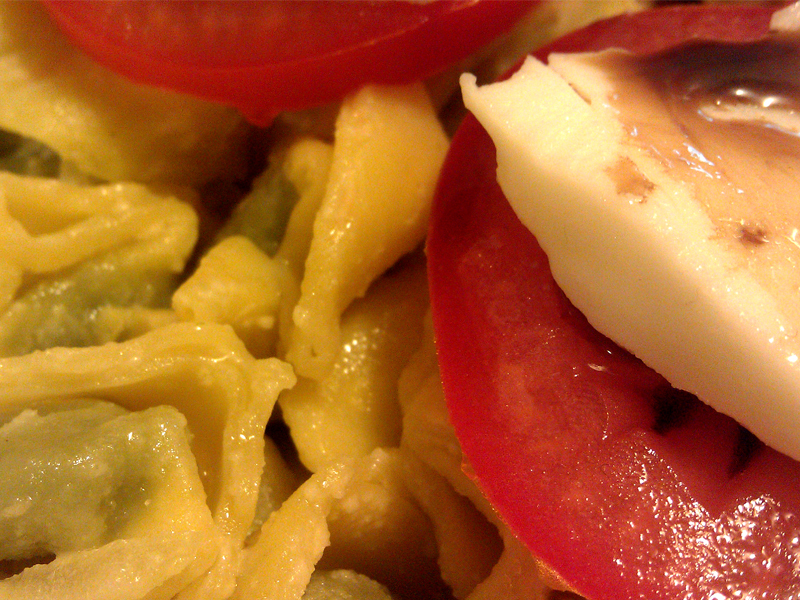 Closer to mealtime, boil/drain your tortellini and prep tomato and cheese slices until the slice:cheese ratio works for you. While the love for cheese can connect almost all of is it also comes with a wide gradient of loves; slice for yourself and don’t look back. Add your oil, garlic, onions and Parmesan to a pot where you’ve replaced the tortellini drained. Toss gently and let sit for 5m before serving topped with slices of tomato/mozzerella. Drizzle the tiniest bit of balsamic vinegar over the whole shebang, close your eyes and dream of Italy. 5 spoons!